This article is about Marth's appearance in Super Smash Bros. Ultimate. For the character in other contexts, see Marth. Marth (マルス, Marth) is a playable character in Super Smash Bros. Ultimate. He was officially confirmed as playable on June 12th, 2018. Marth is classified as fighter #21. This is the first time in the Super Smash Bros. series where Marth is not left voiced in Japanese in all regions. Yuri Lowenthal, Marth’s English voice actor from Code Name S.T.E.A.M., Fire Emblem Fates, Fire Emblem Heroes, and Fire Emblem Warriors, reprises his role in overseas versions of the game while Hikaru Midorikawa continues to voice Marth in the Japanese version of the game, this time with new voice clips. Play VS. matches, with Marth being the 7th character to be unlocked. Clear Classic Mode with Yoshi or anyone in his unlock tree, being the second character unlocked after Lucario. Have Marth join the player's party in World of Light. Marth must then be defeated on Castle Siege for the first two methods or Final Destination for the third method. Marth is considered to be emblematic of swordfighters; his playstyle revolves around spacing—utilizing his unique tipper mechanic to deal high damage and knockback at a distance from his opponent. He has his remaining present attributes; He is in the middleground of lightweight and middleweight, boasting high overall mobility, notably sporting the fastest walking speed in the game (tied with his Echo Fighter, Lucina), a fast dashing speed, average air speed, above average air acceleration, moderate falling speed, and low gravity. 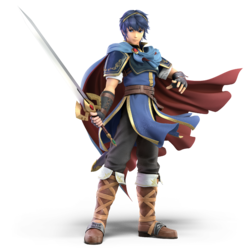 Marth's playstyle revolves around effective spacing, as in all of his other playable appearances, due to his aforementioned tipper mechanic; his sword attacks do the most damage and knockback near the tip of the sword. His frame data is overall above-average, with many attacks having low startup and wide range all-around, allowing him to space efficiently. Because of this, Marth aims to fight a step away from danger, without leaving himself too open to punishment. While Marth's tipper is the most optimal, the larger hitboxes of his sourspots provide benefits as well; they allow him to effectively combo into attacks one after another at a wider range of percentages. Marth's neutral game is also unique by scaling with percent, as set-ups and combos become more rewarding at higher percentages. He also benefits from being one of the few characters in the game who can outright KO through playing his neutral and spacing game; essentially, while Marth's neutral reward is not as rewarding or damaging as other characters, Marth has the ability to win neutral exchanges with relative ease and safety, as well as having consistent set-ups and follow-ups. Marth's advantage state as a whole is quite strong. His combination of good speed and range give him excellent juggling capabilities, as he can easily dash to where a falling opponent might land and catch them with his wide attacks, especially his up tilt and up aerial. His disjointed hitboxes also allow him to challenge opponent's falling attacks safely. Because of this, Marth has an easy time keeping opponents in the air and racking up damage. These traits also grant him strong edgeguarding abilities, as his wide aerials can cover enemy movement well, and his tippers can outright KO offstage opponents thanks to their power. Moreover, his general floatiness also allows him to recover back to the stage after edgeguarding attempts fairly safely. Marth's special moveset provides interesting options as well; his neutral special, Shield Breaker, deals very high shield damage, even when uncharged, and is useful for covering rolls and landings. Dancing Blade is a four-hit combo that can be used to punish sidesteps and rolls, as well as effectively rack up damage. At higher percents, it can serve as an effective KOing option. Dolphin Slash has quick startup, provides slight intangibility during its startup frames, is relatively strong when it first comes out, and has high knockback scaling. These attributes make it an excellent out of shield option and combo-breaker. It is also Marth's primary method of recovery, as its speed can make it difficult to intercept, and it can stage spike reckless edgeguarders. Lastly, Counter provides him with the capability to reverse attacks with 1.2× the damage, KOing if the attack was strong enough; it can also be used against opponents with easily predictable recoveries. Despite his strengths, Marth has some notable weaknesses. Due to Marth possessing a sword, his moves generally have greater ending lag than characters who fight with physical attacks. Though his attacks have quick startup, many of them come with high ending lag, and also suffer from short hitbox durations, leaving him open for counterattacks during certain situations. As a solely sword-based character, Marth's neutral also suffers from a lack of a projectile, and he can struggle against projectile heavy characters and playstyles. This ties in with his vulnerability once he loses the neutral; despite having below average weight and only average falling speed, Marth is susceptible to combos, and his tall hurtbox provides an easy target. Dolphin Slash is his only reliable combo-breaker, but as it leaves him helpless, it can inadvertently put him in an even worse position. Also, while Counter can be used defensively, it leaves Marth extremely vulnerable to punishment should it whiff. Marth also has little defense against juggling, as his aerials are ineffective at relieving such pressure. His tipper mechanic can disadvantage him when attempting to KO, as his attacks don't generate much knockback if not spaced properly, making his KO potential relatively lackluster without proper spacing (most notably with forward smash, forward tilt and aerials). Marth's weak throws tie into his polarized KO power. Except for up throw, they have low knockback scaling, preventing them from KOing at realistic percents, while up throw can only KO starting at 170%, if Marth has no rage. His other throws are somewhat lackluster; aside from having a fairly fast pummel, Marth's throws deal low damage and have high base knockback, making them poor for combos and damage-racking outside of down throw leading into an aerial until high percents. However, it should be noted that the high base knockback of his throws allow Marth to take advantage of his good edgeguarding capability, especially at the edge. Marth himself is somewhat vulnerable to edgeguarding, though he has options for mix-ups with his recovery. Dolphin Slash is his only reliable vertical recovery option, and while it is still a threat to edgeguarders due to its speed and high stage spike ability, its path is linear and its distance fixed, making it fairly predictable. Additionally since this move grants little horizontal distance, Marth is vulnerable to semi-spikes. While Shield Breaker can aid his horizontal recovery, it covers little distance without charging. Marth's also heavily reliant on his double jump for mix-ups in his recovery, and is in significant danger if offstage without it. Overall, Marth is an effective character that has many benefits: high overall mobility, long range, and above-average frame data. However, his close range game is not ideal due to relatively high endlag on his moves, and his sour-spotted moves dealing a low amount of knockback. At his purest, Marth is most rewarding for players with good fundamentals, with many playstyles applicable to him due to his flaws being easily worked around with careful play. Though he received relatively few major direct changes compared to other fighters, Marth benefits greatly from the universal changes of Ultimate. His high dash speed complements the ability to dash cancel into any attack, allowing him to bait attacks with fox-trotting, and use his tilts as more effective spacing tools. The reduced landing lag on all aerials also makes them safer for spacing and approaching, while also enhancing their combo ability. The new limits on the air dodge also greatly enhance his juggling and edgeguarding capabilities, as they provide less leeway for opponents to recover against his wide aerials. Additionally, Dancing Blade has been sped up greatly, making its hits link into each other much more consistently. In the transition, however, Marth received a few noteworthy nerfs. His jab, previously an excellent combo starter and neutral tool, has been altered as with most jabs so that it can only follow up into the second hit from the first, completely removing its powerful jab cancel from Smash 4. His already linear recovery is made less safe by the limits on air dodging as well as the reduction in edge sweet spot size, worsening his endurance. His specials received some small nerfs, with Dolphin Slash and Counter being slightly more punishable than before, and Dancing Blade dealing less damage. Additionally, the faster engine makes landing tippers more tricky, indirectly encouraging the use of Marth's clone and semi-clones, Roy, Lucina, and Chrom, over him. Overall, the benefits Marth gains from the engine changes generally outweigh the nerfs he received, as they reinforce his speed and long range to further improve his strong neutral game, while also improving his ability to rack up damage and finish off stocks. Although he remains as an effective fighter, he has achieved below-average results in Ultimate's early metagame. Meanwhile, his aforementioned counterparts have all done significantly better than him; in particular, both MkLeo and Mr E, his two strongest players from SSB4, now only keep him as a pocket character in favor of his more consistent Echo Fighter. This could imply that they are the superior characters; to what extent, however, is unknown. As with all veterans returning from SSB4, Marth's model features a more subdued color scheme. Various aspects of his design have been subtly modified, such as his shoulder armor, belt, gloves, and boots. His hair is slightly more unkempt, similar to his appearance in Fire Emblem Heroes. Falchion retains its design from Shadow Dragon and the Blade of Light, but has been modified to better resemble its official artwork. Its scabbard is its most significant change, now being near identical to its official artwork compared to its previous grey blue-pattern scabbard from Melee. Marth is more expressive overall. Marth has several new basic animations. His idle, crouch, and sidestep all have new animations, and his jump animations have all been changed as well, resembling (but not identical to) Roy's jumps in Smash 4. Marth's sweetspotted moves use the same heavy sword sound effects as Ike's sword, Ragnell. Marth's side taunt has changed. He only swings his sword once before sheathing it. In non-Japanese versions, Marth is fully dubbed in English. In the Japanese version, Marth has new voice clips for the first time since Melee. His up taunt has him say, "This is it!" in English, as he points his sword upwards. In Japanese, he says "行くぞ！", which means "Let's go!". His side taunt has him say, "I won't lose!" in English. In Japanese, he says "僕は負けない！", which also means "I won't lose!" His down taunt has him say, "Keep your eyes open! ", a phrase similar to "みんな、見ていてくれ!" ("Everyone, watch over me! "), which remains the same in the Japanese version. Marth's victory animations are all different. The second is completely new. He jumps in the air swinging his sword twice, and then lands with a pose that resembles his Counter animation, saying "I cannot afford to lose." (僕は負ける訳には行かないんだ。, I can't afford to lose.) This replaces his old one where he stands with his right arm outstretched before lowering it to his side. Like all characters, Marth's jumpsquat animation takes 3 frames to complete (down from 5). Marth walks faster (1.5 → 1.575). Marth runs significantly faster (1.785 → 1.964). Marth's initial dash is significantly faster (1.5 → 2.255). Marth's air speed is faster (1.02 → 1.071). Marth's traction is much higher (0.055 → 0.114). Air dodge has significantly more ending lag (FAF 33 → 53). Marth's new jump animation has him pick up his feet more, allowing him to short hop over certain projectiles. Both hits have shorter durations (first hit: frame 5-7 → 5-6, second hit: frame 3-5 → 4-5). The first hit transitions into the second hit faster (frame 17 → 11), allowing it to connect better. The first hit has altered angles (78°/65°/90° → 361°/361°/180°/361°) and knockback (55 base/30 scaling → 30 base/15/12/12/12 scaling) to keep opponents close to Marth, akin to other neutral attacks. This allows it to jab lock much like Smash 4 before 1.0.8 update, but most importantly removes all its guaranteed jab cancel setups, which made it one of Marth's most potent punishment tools in Smash 4. The second hit has more startup (frame 3 → 4). The first hit has an altered animation where Marth swings in a more horizontal arc, matching its hitboxes better. Dash attack's tipper hitbox deals more base knockback (80 → 95), improving its KO potential. The move has a different animation, with Marth swinging in a slightly more horizontal arc. Forward smash's non-tipper hitboxes deals less knockback (55 base/80 scaling → 48 base/75 scaling), no longer being able to KO middleweights under 100% at the edge. Down smash consistently launches opponents at a horizontal angle, allowing it to set up edgeguards and KO near edges more effectively. It has one frame more ending lag (FAF 55 → 56). The second hit's non-tipper hitboxes have less base knockback (70/50/50 → 40/40/40), hindering its KO potential. The first hit's non-tipper hitboxes have different base knockback in between the previous vertical-launching and horizontal-launching hitboxes (70/50/50 → 60/60/60). All aerials have reduced landing lag (12 frames → 7 (neutral), 16 frames → 10 (forward), 17 frames → 10 (back), 14 frames → 8 (up), 24 frames → 14 (down)). Neutral aerial's first hit has more base knockback (30 → 45/45/35) and altered angles (80°/75°/65°/90° → 75°/80°/90°), allowing it to connect into the second hit while rising, and improving its combo potential on landing combined with its lower landing lag. Forward aerial's tipper hitbox has less knockback scaling (90 → 80), hindering its KO potential. The removal of teching for grounded meteor smashes improves down aerial's combo potential onstage, compounded further by its lower landing lag. Standing grab has less startup (frame 7 → 6). Dash and pivot grab have more startup (frame 8 → 9 (dash), 9 → 10 (pivot)). All grabs have increased ending lag (FAF 30 → 35 (standing), 37 → 43 (dash), 35 → 38 (pivot)). Marth's throws are no longer weight-dependent. This improves his down throw's combo potential on heavyweights, but reduces it on lightweights. All of Marth's throws except up throw release the opponent slower (frame 15 → 18 (forward), 9 → 19 (back), 16 → 20 (down)), making them easier to DI. Pummel deals less damage (2% → 1.3%). It deals more hitlag (4 frames → 14), but has much less startup (frame 6 → 1) and ending lag (FAF 16 → 7). Marth has a new forward throw, a quick elbow strike to the opponent's chest. Due to the faster knockback physics and reduced hitstun for higher knockback values, it has lost its combo potential. Up throw deals more damage (4% → 5%), with its knockback compensated. Down throw deals less damage (5% → 4%), with its knockback compensated. Its animation has been changed slightly, with Marth slamming the opponent onto the ground with a more exaggerated throw. Shield Breaker can be angled vertically. It deals 1.15× its regular damage if it hits an opponent's head. Fully charged Shield Breaker has slightly more start-up (frame 78 → 79). Marth composes himself after performing the move. The move triggers Special Zoom upon breaking an opponent's shield. All swings except the first have less startup (frame 9 → 5 (second, neutral), frame 7 → 4 (second, up), frame 6 → 4 (third, neutral), frame 8 → 5 (third, up & down), frame 13 → 7 (fourth, neutral & down), frame 11 → 6 (fourth, up)), allowing the move to execute faster and connect all hits more reliably. The fourth downward swing's hits after the first are also faster (frame 19, 25, 31, 37 → 10, 13, 16, 19), allowing them to connect better and preventing opponents from jumping out of them at low percents. All swings except the fourth ones deal less hitlag, allowing the move to transition faster and making it harder to SDI out of. The first swing has less ending lag (FAF 42 → 40 (grounded), 32 → 30 (aerial)), as does the fourth upward swing (FAF 51 → 45). The first two neutral swings have altered knockback, allowing them to more consistently link into the other hits, and granting them the ability to lock. The fourth forward swing's tipper has greater knockback overall (60 (base)/130 (growth) → 85 (base)/125 (growth)), improving its KO potential. The first swing has more startup (frame 6 → 9). The fourth downward swing has more ending lag (FAF 72 → 75), however combining this with the overall faster swings, Marth actually ends the move much later than he did in previous iterations. All swings deal less damage (3%/4% → 2.5%/3% (first & second), 4%/5% → 3%/4% (third, neutral & up), 4.5%/5.5% → 3%/4% (third, down), 5%/7% → 4%/6% (fourth, neutral), 6%/8% → 5%/7% (fourth, up), 6% → 5% (fourth, down, last hit's tipper)). The fourth forward swing's non-tipper hitboxes deal less knockback (60 (base)/130 (growth) → 74 (base)/103 (growth)), hindering its KO potential. The fourth upward swing has more base knockback (60 → 80/85), but drastically less knockback growth (118 → 40), removing its ability to KO at realistic percents. Dancing Blade's neutral swings all have altered animations, except for the third. The first one is an outward swing similar to his forward tilt, the second is a vertical swing instead of a horizontal one, and the final swing no longer has Marth spinning before he slashes the opponent. The third downward swing has an altered animation, now being a low outward swing instead of a stab. Dolphin Slash has more landing lag (20 frames → 24). It leaves multiple afterimages of Marth during the leap. Counter's counterattack has less startup (frame 5 → 4). Counter has more ending lag (counter: FAF 60 → 65, attack: FAF 36 → 41). Marth once again vocalizes when connecting a successful Counter. In English, he'll say "My turn! ", "Nice try!" or "Predictable! "; the last of which, in Japanese, is changed to "させない！". If a powerful enough attack is countered, it causes a large yellow flash, and plays the noise from Critical Hit if the counterattack successfully lands. Due to the changes to teching, Critical Hit is almost impossible to tech though at some circumstances such as Shulk's Shield Monado Art can still tech at very low percentage. Dash grab has more range. For simplicity if, for example, Marth's blade does 4% damage while the tip does 6%, and the attack has no other hitboxes, it is written as 4%/6%. 3%/5% Slashes Falchion twice in front of himself. The first hit's tipper pulls opponents towards Marth, ensuring that the second hit connects. The first hit can also jab lock. 9%/12% A fast upward swipe while leaning forward. Has a large arc that is useful for spacing, and deals moderately strong knockback when tippered, KOing middleweights at the edge around 100%, making it a go-to spacing and KO option. Deals much weaker knockback if untippered. The tipper can hit opponents standing on top of some platforms. Anti-air Slash 6% (blade), 5% (body), 9% (tip) Swings Falchion in a large arc above his head, with a large hitbox that can hit enemies behind him. Can combo into itself or aerials at low percentages and KO at high percents when tippered. Covers platforms very well and is useful for juggling. 7%/10% A quick crouching sword poke. Marth's fastest tilt, which is useful for interrupting grounded approaches and creating space. Deals semi-spike knockback, making it useful for edgeguarding. The tipper knocks opponents into a tumble around roughly 60%, with the blade hit starting to do so around roughly 125%, which can force opponents into a tech chase situation. 10% (blade), 9% (body), 12% (tip) A quick, running, upward-sweeping diagonal slash. Low knockback, but deals decent knockback if tipped. Has notable ending lag and very low hitlag if untippered, making it rather unsafe against shields. The ability to use the faster and safer forward tilt out of dash makes this move's use rather niche. Dragon Killer 13%/18% Rotates his body counterclockwise with a strong overarching one-handed swing from his head to the ground. Moderately fast startup, but high ending lag. Although lackluster when hit with the blade, the tipper of this attack has incredible knockback, being able to KO middleweights at 75% from the stage's center and as low as 37% near the edge. Justice Sword 3% (ground), 13% (blade), 17% (tip) A quick, upward thrust. The weak grounded hit can knock nearby opponents into the main attack. Good for aerial protection and chasing down landing opponents. If tippered, it deals extremely high knockback, although this is difficult to do unless an opponent falls directly on top of Marth. 8%/12% (hit 1), 12%/17% (hit 2) Sweeps Falchion on the ground toward the front outward then toward the back inward. The back hit has much stronger power, while the front hit is significantly weak unless tippered, where it will do moderate knockback. It also has high ending lag. 3.5%/5% (hit 1), 7%/9.5% (hit 2) Two horizontal slashes around himself via an inward slash followed into a full 360° outward spin. The second hit can hit on both sides of Marth, and can be used to create space by short hopping then fast-falling immediately after using the move in the air. The first hit has very low knockback scaling, which, combined with fast falling and the move's low landing lag, allows it to combo into many of Marth's tilts, and even his forward smash, even up to around 175%. The second hit's tipper has strong knockback, KOing middleweights at the edge around 100%. 8%/11.5% Does a descending crescent slash in front of him with great coverage. This is Marth's best tool for air combat, and its reasonably low landing lag and strong tipper make it very safe when spaced properly. Its tipper is also decently strong, KOing middleweights at the edge around 133%. Around 24% with the tipper, or around 40% with the sourspot, it begins to knock opponents into a tumble, which can force a tech chase situation. About Face 9%/12.5% An upward crescent slash behind him in an inward swipe. Has the interesting property of turning Marth around, changing the direction he is facing. Similar use to his forward aerial, although with more knockback and a smaller hitbox. Can be used a few frames before landing to catch opponents with a tipped blow, with correct spacing. Has a rather strong tipper given its speed, KOing middleweights at the edge around 100%. 9.5%/13% An overhead crescent slash with good coverage, ending in a delayed somersault. Marth's fastest aerial, it is good for juggling thanks to its large arc, making it a good anti-air as well, but it has weak knockback unless tippered. Due to its angle and low landing lag, it makes a reliable combo starter when hit with the blade, comboing into aerials even around 100%. 12% (blade), 14% (non-meteor tip), 15% (meteor) A downward, wide crescent slash with large coverage. If the attack connects at the middle of the swinging arc (directly below Marth), it serves as a powerful meteor smash. However, the meteor smash window lasts only one frame (frame 11). Can be useful against cross-ups and as an out of shield option as it starts behind Marth and covers a wide area below him. — Reaches out with his free hand. 4% An elbow strike with his sword arm. 4% Tosses the opponent over his leg, sending them behind him. Its high base knockback allows him to set up edgeguarding, but it cannot combo or KO reliably. 5% A powerful one-armed upward throw. Marth's strongest throw, which can KO at around 170%. 4% Throws opponent to the ground with one arm, bouncing them upwards. At low to mid percents, its angle and high base knockback allow it to follow up into an up or back aerial depending on DI, or only an up aerial at higher percents. Despite having low knockback scaling, it still loses its combo potential around roughly 80%-90%. 7% Spins around gracefully and slashes Falchion in a circle. 7% Swings Falchion behind, then in front of him before getting up. 5% Stabs behind him, then slashes in front of himself before getting up. 9% Backflips onto the stage and slashes. Shield Breaker 8%/9% (uncharged), 22%/24%/27.6% (fully charged) Marth assumes a readying stance and charges Falchion at chest level before powerfully thrusting it forward. This attack deals massive shield damage even when uncharged, and will instantly break shields at full charge, although it can be safely perfect shielded. The aerial version gives Marth a very slight horizontal boost, while a fully charged aerial version will thrust Marth in whatever direction he's facing, giving him a strong horizontal recovery option, albeit with very high startup. Deals very high knockback when tippered, making it a powerful KOing option, especially against dazed opponents. Can be angled up or down, though this does not change the damage or knockback. The attack deals 1.15× regular damage if it hits the opponent's head, though this appears to be out-prioritized by any hitbox striking a non-head hurtbox. Dancing Blade Varies (see below) A sequence of sword slashes with several variations based on directional input. Four slashes total, with each capable of being altered in direction, allowing for eighteen total possible combinations. Standard strikes are trailed red, high strikes are trailed blue, and low strikes are trailed green (see table below for details and limits of the move). Dolphin Slash 11% (clean), 7% (late blade), 6% (late body) Marth performs a high-speed jumping uppercut slash that can be B-reversed. Has a powerful sweetspot and grants very slight intangibility in the first few frames, which can easily cause stage-spikes under the right circumstances. Grants good vertical distance but is rather lacking in horizontal distance. Does not snap to the edge until after its hitbox is gone. Counter 1.2× (minimum 8%) Marth assumes a defensive stance and retaliates against incoming attacks. The power of the counterattack scales with the strength of the attack blocked. Starts up on frame 6 and lasts 22 frames. Ineffective against projectiles and attacks with sufficiently long reach, such as many of Shulk's or Simon's tilts and smash attacks. Critical Hit 60% Marth raises Falchion skyward, then lunges in one direction, attacking the first opponent he connects. Immense knockback, enough to one-hit KO any character on any roofless stage. This move is impossible to tech unless using FS Meter or against Shulk's Shield Monado Art at very low percentage. Pressing the special button again will cause him to stop mid-dash. First Hit (Neutral) 2.5%/3% Does an outward slash. Deals very little knockback even at extremely high percents. Can jab lock. The tipper lifts opponents off the ground slightly, making it combo into the second hit more consistently. Second Hit (Up) 2.5%/3% An upwards lifting slash. Has greater vertical reach, but shorter horizontal reach than the first hit or the second neutral hit. Lifts opponents slightly off the ground, with the tipper hit pulling them in slightly. At high percents and when at a distance from the opponent, its shorter reach can be used to intentionally miss so that the last two hits can connect properly. Second Hit (Neutral) 2.5%/3% Does an inward slash. Has a slightly shorter hitbox than the first hit, which can lead to it sometimes missing if the first hit is landed from too far away. Deals very little knockback, even at extremely high percents. Can jab lock. Third Hit (Up) 3%/4% Does an upwards slash while turning clockwise. Launches opponents slightly up and away, leading into the upward finisher's tipper fairly consistently if delayed a bit. Third Hit (Neutral) 3%/4% Takes a step forward and does a leaning outward slash. At close range, this can be used to combo into the neutral finisher's tipper by delaying it, though otherwise this hit may push opponents too far away for the fourth hit to connect at all at high percents. Third Hit (Down) 3%/4% Leans in and does a horizontal slash low to the ground. Deals less knockback than the other third hits, which can make it useful for connecting with the neutral finisher at higher percents, when the third neutral hit may send too far away. Fourth Hit (Up) 5%/7% Twirls counterclockwise and does an upward slash. Launches opponents up, making it useful for starting juggling strings. Has the least ending lag of the three finishers. Fairly low knockback even when tippered. Has greater vertical reach than any other hit of the move. Fourth Hit (Neutral) 4%/6% Turns counterclockwise, steps forward, and does very powerful vertical slash downward. This is the strongest finisher in regards to knockback. The tipper by itself will KO middleweights near the edge as low as 71%, but the hit is much weaker when not tippered, only beginning to KO around 155%. Fourth Hit (Down) 2% (hit 1-4), 4%/5% (hit 5) Does a flurry of five lower stabs. Deals the most damage of the three finishers, wearing down shields well, and can shield poke low shields. Has the highest ending lag of the three finishers. Warps onto the stage using a warp circle with a twirl and unsheathes his sword. Holds his hand to his chest, closes his eyes, and silently takes a breath. Brushes his hair out of his face. Performs a Shield Breaker, then poses with Falchion at his right side, saying "The day is mine!" (今回は僕の勝ちだね？, This time victory is mine, isn't it?). His ending pose mirrors his official artwork from Smash 4. Sheaths his sword, keeping hold of it, and says "I live to fight again." (今日も生き延びることが出来た。, I was able to survive again today.). Jumps in the air swinging his sword twice, then lands in a pose resembling his Counter animation, saying "I cannot afford to lose!" (僕は負ける訳には行かないんだ。, I can't afford to lose.). An orchestral, sped-up cover of several bars of the Fire Emblem Theme, the title theme for the original Fire Emblem: Shadow Dragon and the Blade of Light, which has since become the main theme of the series and appeared in every game. MkLeo - Placed 7th at 2GG: Prime Saga. Mr E - Placed 17th at both Glitch 6 and Overclocked Ultimate and 33rd at GENESIS 6. Marth fights draconic opponents on various medieval-themed stages. The Mii Fighters sport dragon-themed costumes. 1 Giant Charizard Castle Siege Story 5 Meeting Charizard's Pokémon Trainer is absent. Credits roll after completing Classic Mode. Completing it as Marth has Fire Emblem Theme accompany the credits. Marth was among the fighters that were summoned to fight the army of Master Hands. During the opening cutscene, Marth took notice of the massive number of Master Hands, telling the other fighters that they would "need to take down about ten [Master Hands each]." He was present on the cliffside when Galeem unleashed his beams of light. He was vaporized offscreen and placed under Galeem's imprisonment along with the other fighters (excluding Kirby). During the mode itself, Marth can be unlocked early on shortly after rescuing Mario, where the player arrives at a crossroads and has the choice to rescue him, Sheik, or Villager. If one of the others is rescued first, Marth's path will be blocked by a force field created by Master Hand, which will disappear upon defeating a boss or can be circumvented by looping back to the other side. Marth's Fighter Spirit can be obtained by completing Classic Mode. It is also available periodically for purchase in the shop for 500 coins. Unlocking Marth in World of Light allows the player to preview the spirit below in the Spirit List under the name "???". As a Fighter Spirit, it cannot be used in Spirit Battles and is purely aesthetic. Each Fighter Spirit has an alternate version that replaces them with their artwork in Ultimate. Prince Peasley Mario & Luigi series •Marth Shield 1,600 3D Land N/A •The enemy's melee weapons have increased power This is Minion Turf! Marth countering on the Great Plateau Tower. Performing Shield Breaker on Coliseum. Taunting in his white costume on Mario Galaxy. Dodging Ridley's Plasma Breath on 3D Land. Idling with Lyn on The Great Cave Offensive. With Toon Link, Pit and a giant Jigglypuff on The Great Cave Offensive. Marth and Lucina taunting on Castle Siege. Marth getting hit by R.O.B. 's down smash on Tomodachi Life. Marth, Link and Shulk advancing towards Rathalos on Coliseum. Idling on Great Bay Ω. With Kirby, Mario, Link, Inkling, Pit, Ridley and Villager on Battlefield. Super Smash Bros. Ultimate is the first Smash Bros. game where Marth points Falchion upwards rather than downwards in his official artwork. The images of Marth facing Ridley and Rathalos, as well as Marth's Classic Mode battle sequence, are likely a reference to the common trend of Fire Emblem games ending with a boss battle against a dragon, specifically Marth’s battle with Medeus. Marth is the only Fire Emblem character who can be unlocked in the Light Realm in World of Light. Roy is also found in The Last Battle imprisoned by Galeem. This makes Marth and Roy the only Fire Emblem characters affiliated with Galeem. Despite receiving both new idle and crouching animations, Marth still reuses the previous animations when holding a small item. He shares this quirk with Sheik, Lucina, Roy, Chrom, and Wolf. Marth is part of Yoshi's Classic Mode character unlock tree; both characters' Classic Mode routes are reptile-themed, and share certain characters (Charizard, King K. Rool, Ridley and Rathalos), with Yoshi himself being fought in Marth's route. Marth has the most combined clones and semi-clones of any character at three, being Roy, Lucina, and Chrom. This page was last edited on April 18, 2019, at 11:28.